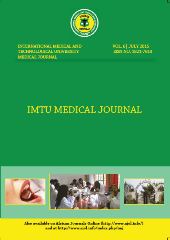 The IMTU Medical Journal is a peer-reviewed journal published by the International Medical and Technological University (IMTU) in Dar-es-Salaam, Tanzania. The major objective of the journal is to publish original research, case studies and review articles in the field of Biomedical Sciences, Public Health, Social and Traditional Medicines, all Medical Sciences, its Specialties, Veterinary Medicine and Medical Biotechnology. The journal is a source of inspiration to upcoming medical scientists ,practioners, research scholars, educationists and scientific community across Africa and the world.